Project Budget 4×4: Why so cheap? – HubNut – celebrating the average! Project Budget 4×4: Why so cheap? The fleet is running over-capacity at the moment. My wife and I agreed a four car limit, but the return of my old BXmeans that we have five vehicles now. This has its pros and cons. Sharing the mileage out amongst the cars means that service intervals don’t come around very often, but keeping on top of the inevitable maintenance becomes a bit of a pain. Just remembering when each car needs a service/MOT is tricky to keep on top of! What’s the problem with the Maverick? It’s great, so why so cheap? So, I half-heartedly started looking at what Ford Mavericks are going for at the moment. Truth be told, I don’t want to sell it but it is the thirstiest motor on the fleet, and the one I have most trouble trying to justify. Due to its fuel guzzling nature, it’s not the one I ever choose for long trips. It’s just an occasional workhorse and play vehicle. Watching similar examples on Ebay has hardly made me keener to sell. Maverick 2.4s are struggling to top the £500 I paid for mine back in January. Why is that? Firstly, thirst. Yes, it drinks a lot, but the diesel is not that much better (27mpg to 22) and diesel fuel is more expensive to buy. Perhaps it’s because they’re a bit rubbish? Well, that doesn’t stop people paying three times as much for a Discovery in similar condition! Besides, they’re really not rubbish at all. Off-road, they’ll go pretty much anywhere that a Discovery will go – which is impressive. I really do rate Land Rovers when it comes to proper mucky stuff, but the Maverick has all the kit it needs. Separate chassis, low ratio transfer box, limited slip differential at the rear and (ok, rear only as the front suspension is poor) good axle articulation. Very similar to a Mitsubishi Pajero/Shogun in fact, but these also fetch silly money by comparison. I can’t believe Mavericks are cheap because of the looks either. I find it a really appealing vehicle to look at. The inside is a bit cheap and plasticky perhaps, but that’s true of almost any Nineties car. So, as selling doesn’t look very appetising, I shall just keep it for now. 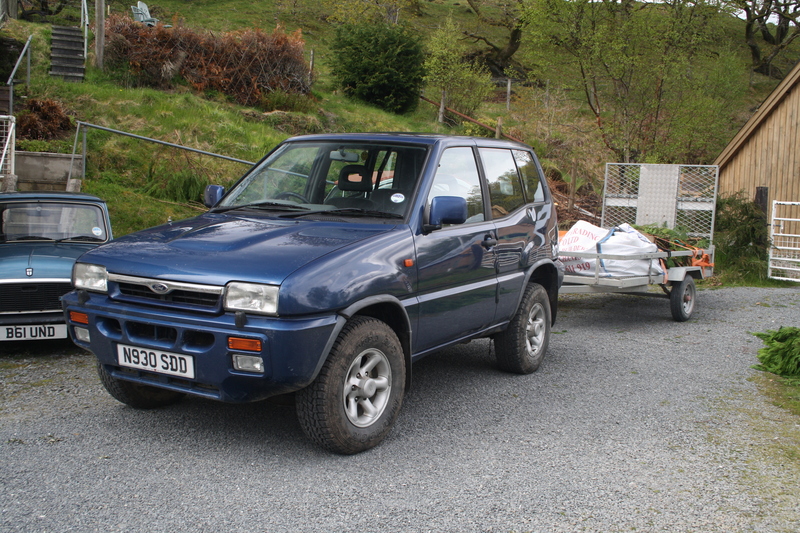 After all, it’s useful for lugging a trailer around and still good fun when I go laning. It’s a really nice car overall that’s hard to fault, so why doesn’t anyone else think so?